Preface. Biological Treatment Processes. Anaerobic Wastewater Treatment. 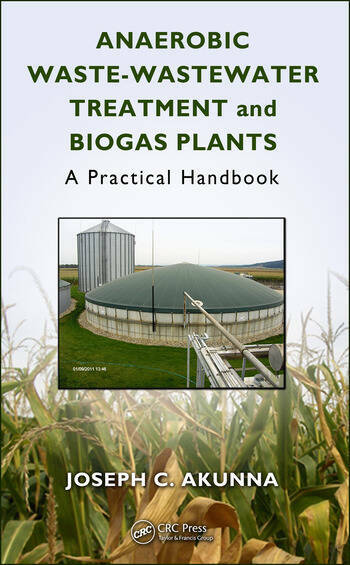 Anaerobic Digestion of Organic Solid Residues and Biosolids. Pre-Treatment in Anaerobic Treatment. Post-Treatment, Reuse and Management of Co-Products. Application in Warm Climates and Developing Countries. Case Studies. References. Appendices. Professor Akunna has a BEng (Hons) in Civil Engineering, MSc in Hydraulics and Water Resources Engineering, MSc in Environmental Science & Technology and PhD in Environmental Engineering. He currently holds the Chair of Water & Environmental Engineering at Abertay University, Dundee United Kingdom, where he is also the Director of Postgraduate Environmental Engineering Education, and a founding member and co-Director of the University's Urban Water Technology Centre. He has over 25 years’ research and teaching experience in hydraulics and water resources management, and in engineering application of physical, chemical and biological chemical processes for the control and abatement of aquatic pollutants, and in resource recovery from municipal and industrial wastes and effluents . He has developed innovative portable and decentralized treatment systems, some of which are commercially available. He is consulted widely by public and private sector organizations and has participated in and led many national and international research and development projects. He also develops and delivers postgraduate and training courses in the subject area for the water and environmental industry professionals and regulators from the UK and many other countries. Professor Akunna has authored and co-authored over 200 publications and research and consultancy reports in the subject area, and is a member of many professional organizations, including the World Biogas Association, where he is a founding and advisory board member.